Eating one's own kind is a completely natural behavior in thousands of species, including humans. 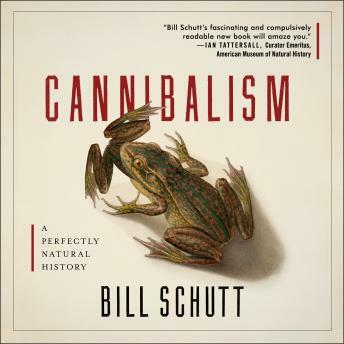 Throughout history we have engaged in cannibalism for reasons related to famine, burial rites, and medicine. Cannibalism has also been used as a form of terrorism and as the ultimate expression of filial piety. With unexpected wit and a wealth of knowledge, Bill Schutt takes us on a tour of the field, exploring exciting new avenues of research and investigating questions like why so many fish eat their offspring and some amphibians consume their mother's skin; why sexual cannibalism is an evolutionary advantage for certain spiders; why, until the end of the eighteenth century, British royalty regularly ate human body parts; and how cannibalism might be linked to the extinction of Neanderthals. Today, the subject of humans consuming one another has been relegated to the realm of horror movies, fiction, and the occasional psychopath. But as climate change progresses and humans see more famine, disease, and overcrowding, biological and cultural constraints may well disappear. These are the very factors that lead to outbreaks of cannibalism-in other species and our own.